The lake came up another 3” in the past few days so I’m gaining confidence that we’ll be able to host a summer lake event in August or maybe Labor Day. Another foot will cement it. The fish must have some kind of broad band communication system because the number and size of the fish showing up at feeding time is increasing every day. The last to show up are the giant bluegill/bream. I guess it could be that with the water rising they’re moving closer to shore but a large part of it has to be me spreading a pound or so of the fish feed around the dock every day. Plenty of turtles too although I haven’t seen any of the softshells yet. I haven’t lowered the boat into the water yet but I could for sure. Probably do that when we get back from NC. You may be surprised to learn that bluegills can see through lily pads. If one of the little food pellets lands on top of a pad, in short order one will spot it (from underneath) and poke through the bottom of the pad to get at it. That’s pretty amazing since the pads are not transparent and are fairly thick so it’s surprising that they can see there’s something on top of the pad and even more surprising that they have the ability to poke a hole in the pad to get at it. Even when I’m not feeding them, you can hear bluegills popping holes in the pads to get at insects that have landed on a pad. Well I got thru my gauntlet of doc’s with no problems at all; good numbers top to bottom. The final hurdle was the dentist for an annual cleaning and checkup. Got thru the cleaning and then the dentist came in to do a final check. Sure enough he spotted a little something that turned out to be a dead tooth under a cap which would need something like a root canal. Our guy doesn’t do such things but made a referral to a compatriot in Daytona – Nancy had some special work done by the same guy a few years back and was ok with him. There’s no emergency but something that should be addressed before too long – I think Nancy already has me set up for a visit the day after we get home. They said I could take up to 8 advils a day if necessary. That made me feel much better! Honestly, I am not hurting at all and wish I didn’t even know about it. 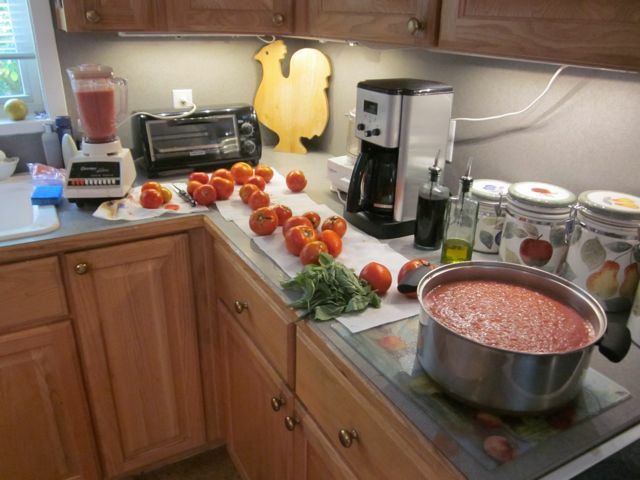 Nancy is making the last batch of sauce for a few weeks. This batch will be used to make the lasagna for the NC trip this weekend. Speaking of the trip – wouldn’t you know it that a tropical storm, Dorian, has formed and is generally heading in the direction of the East coast. The current projection has it in the vicinity of Puerto Rico next Tuesday which makes it a possible issue for us toward the end of our trip. We’ll just have to keep our eyes on it and act accordingly. The fish feeding project is paying dividends. When I started a few weeks back there were virtually no fish to be seen. Within a few days little bluegills were showing up and after a couple of weeks, the onslaught of shiners and larger bluegill mentioned in the last post. Today the first large bass showed up and made a couple of slashes into the feeding shiners. There were two bass I would guess to be in the 3-4# range. The speed of their charges is unbelievable. I’m guessing these guys will be in the 5-6# range in short order based on the ready availability of choice shiners. Not much going on in the garden these days in terms of actual harvesting except for tomatoes which are on their last legs. There are baby eggplants forming and the cuc’s are putting out little mini guys. The plants are climbing the trellis really nicely so that’s working out as planned. The late planted pole beans are likewise climbing the trellis and reaching 10’. I still have doubts about actually getting any beans or cuc’s this late in the summer but we’ve had lots of overcast days and not the usual swarms of butterflies and the resulting caterpillars. If we do have success, we should be picking right after coming back from North Carolina in a couple of weeks. I think I mentioned that July is normally a bad month because all my annual checkup things happen. It’s really a drag because each visit also involves two trips – one to get blood tests and one to review the results. This year it’s even worse because somehow the dental visit also happens. So on Thursday I go to the doc then to the dentist. That’s just not right. I need a new scheduler. As I said, the case should never have been brought to trial. It was a political decision, not a law enforcement decision. And, also as I said, there was no rioting. This is Central Florida, not Detroit or Cleveland. Certainly there would be emotions on both sides but Seminole County is populated by rationale citizens. I hear the Rev Al is coming to town to stir the pot. What a surprise. I had to laugh when the Rev Jackson said that a jury that was all female was not fair. That should have caused a few lib hearts to flutter. Update – I’m at the 6 month point and 55 shaves into the Shave Secret product test and still not at 50% on the juice. The stuff is amazing but what’s really amazing is that I haven’t dropped the 18 ml container and messed up the test. I probably missed a drop or two when trying to measure out 3 drops each time but at this point, I can say that for sure it would last me a year and give me 125+ shaves. Another update – Add Illinois to the states that will be represented at our 50th. I mentally caught it a few hours after posting but wasn’t sure Tommy was onboard 100% and didn’t want to put him under any pressure. I love that he picked it up by reading the blog!!! I can use it as a readers’ test. The lake is rising about 1/2” a day. That’s how much rain we’ve been getting daily compared to everywhere else in the state that’s been getting 2”. Even so, it’s now up to the 3rd rung in the ladder -swimmable when it gets to the fourth rung. Not sure it’s related to the water level, but for the first few years we were here the lake was loaded with shiners. Shiners are a shiny, carp like fish that are a bass’s favorite dinner. They are easily caught with a small hook and then rehooked onto a giant bass hook. Several times I caught a dozen or so, kept them in a cooler with a portable circulation system, and went off to some other lake. Often with great success. But for some reason a few years back, the shiners virtually left the lake or found some secret hiding space off in the middle somewhere and I had to switch to using baby bluegills when I just wanted to lazily bait fish. No more. The shiners are back big time. After cleaning up the dock area last month, I started feeding the fish again and have been blown away by the shiner population. We’re loaded with small bluegills, not seeing any of the giants from a few years back yet and not seeing any big bass cruising in looking for a quick lunch, but they will and I’ll be ready. Gator gone. I got a report that it was almost 4’ long and that the tail is now residing in a freezer. I also heard that it was lured to it’s fate by – get ready for this – an Iphone App that mimics a Gator call. I never gave that app a thought but I bet there are duck calls, turkey calls and all manner of hunting aids. There’s something obscene about that. Looks like perhaps the storm season is starting in earnest with a weak tropical storm, Chantal, projected now to ride up the east coast. If it follows the current forecast, it would pass a couple hundred miles offshore from us. That’s perfect because we not get much in the way of wind but would be on the juicy side of the storm and maybe pick up some substantial rain. We could start feeling it by the weekend – or not. Really looks to to me like it’s going to fizzle out long before it gets this far. Here’s a tip. If the bluetooth on your computer ever dies, you can get an external USB bluetooth module. A year or so back we replaced our mouse with a bluetooth connected track pad. Last week it wasn’t working. Changed the batteries in the track pad – still not working so I called Apple. The support tech told me it was probably the internal bluetooth module and that I’d have to leave the computer with them for 3-5 days and pay $150+. Hello mouse. (an aside – when I called Apple I was having trouble getting out of the automated answering system which had started by telling me it understood complete sentences. I was frustrated and told it to get me connected to a human and it did.) I called a private but authorized Apple repair shop in Deland and got the same story except the guy added that I could go to Radio Shack or equivalent and pick up an external device that would do the same thing for $30. Radio Shack turned out to be a dud but Tom ordered a device from Amazon that worked like a world champ. Plug and play; $13. Hello trackpad. We head up to western NC towards the end of this month for a 50th anniversary celebration. Not sure what the total head count will be but right now we’re expecting family from here, NY, South Carolina, and CA for a weeklong party on the Little Tennessee River near Franklin. Really looking forward to a break from the heat and just being together there. That plus the smallmouth bass fishing on the river. They’ve been having the wettest spring and early summer ever so maybe the fishing will be only a dream. I’ve fished it before and did very well but it was always when the river level was down. Simon is already in the area working in the Great Smokey Mountains on the NC/Tenn border. He’s a camp counselor at a nature preserve there inside the park, Tremont Institute, and will be finishing up his tour of duty the same time we arrive. So he drives about an hour and vacations with us. Poor guy. After the 2 months in the Smokies and the week with us on the river, he goes to the Grand Tetons for a 10 day certification program for first responders. That’s what I call a fun summer. Looks like the Zimmerman trial is winding down. Watching lawyers in action raises my blood pressure to near popping. I keep waiting for one of the witnesses, getting ravished by a lawyer, to snap and pop one of them. Some excitement last night. Our neighbor, Barbara, had cataract surgery a couple days ago then went back for the next day check early yesterday. I noticed she hadn’t come back home by about 2PM and wondered if there were any problems. About 6 she called and said all was well and after her checkup they had gone to George’s infection doctor to check on the status of his post op infection problem. She said they changed much of his medicine and he would be on this new regimen for 6 weeks but all was well. About 5 minutes later she called back and said she had just called 911 for George, who’s heart was doing wheelies. Nancy boogied over there and I went up to the main road to wait for the ambulance and guide them down to their house which is difficult to spot from the road. Seems that George was likely having a major reaction to the new meds. The EMT’s came, lights and sirens and were on site within 5 minutes and loaded him onto a stretcher and into the vehicle within another 5. Barbara called about 9 and said they had him stabilized and sleeping at the hospital in Ormond. Home at midnight. That poor guy is on so many different meds that it would seem impossible to forecast what interactions might be going on inside him. Take a close look at the photo. That’s a rat snake crawling horizontally along the side of the house, about 8’ above ground level. Can you believe that? It’s about 2’ long and maybe as big around as my pinkie finger. 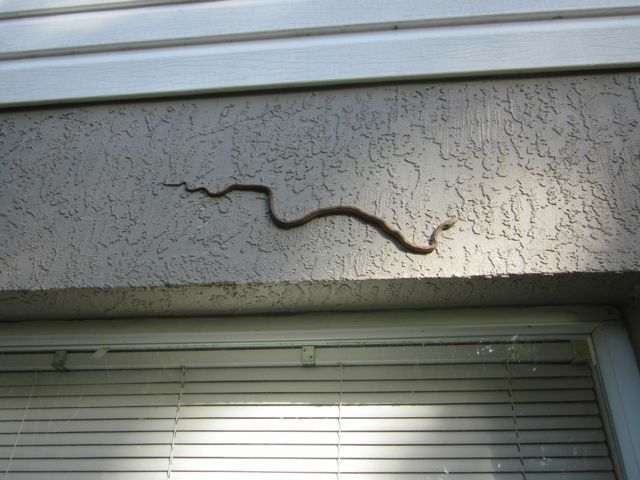 The surface is rough, stucco like finish, but I never would have guessed that a snake could do that. Rat snakes are good guys so seeing one around is a positive. Another little critter story. About a month ago I went out early to get the paper and walked up on a set of 3 baby armadillos. The babies are tiny miniatures except they are pink as compared to gray brown when mature. As soon as they realized I was on them, they scattered into the brush. The next morning, they were back on the gravel driveway only this time instead of scattering, they started following behind me ,like I was the parent in their life. They did that for a few days and then I guess an older ‘dillar told them I was not one of them. I still see them every couple of days and they are growing rapidly but still retain the pink shade. They scatter off into the brush when I come within about 10’. My biggest nemesis around here are fire ants and these guys eat fire ants so I’m fine with them, even when they’re digging up the lawn or what passes for a lawn. This week’s batch of spaghetti sauce was 20 quarts. The photo shows most of the process with some in the blender, some in the pot, and some still on the hoof. The greens you see are basil and oregano. That’s an 8 quart pot shown, (I think) so we had to break out the bigger 12 quart model to finish off the batch. The end is not in sight so far as the tomatoes are concerned but we’re not eating fast enough to clear space in the freezers to hold it all and I’m not buying another freezer. It’s unusual to have a president who is equally inept at domestic and foreign affairs, Jimmy Carter comes to mind, but Obama’s doing it with ease whereas Jimmy had to struggle to achieve it. I’ve mentioned several times how well the tomato crop is coming this year and that includes cherries, plums and traditional round varieties. By far this has been the best year for tomatoes across the board. So I was surprised when several folks who visited George in the past week or so were amazed to see my plants and related that nobody was getting any tomatoes this year. And these folks came from several different areas. Apparently everyone is suffering from fruit rotting on the vines. I didn’t personally talk to them but George and Barbara told me about it and they honestly had to tell their friends that they had no idea what I did differently. If they had asked I would have told them it was just luck – but it isn’t. One guy that I did talk to about two weeks ago had the same story and I asked him what variety he was growing and he looked at me like I was wacky. He didn’t seem to know there were different varieties and just said that he planted whatever looked best at Lowes. Over the past 5 years I’ve probably gone through a dozen or more varieties to find the ones that seem to perform best in my garden so at this point the lion’s share of what I plant are one’s with a good history here. I also spend quite a bit of time planting each one and have developed a set of techniques that seem to be working – some bizarre enough not to discuss for fear of being labeled as a quack. You’d be amazed at the amount of advice I get, relative to the garden, from visitors who had just before told me how nice it looked and how poorly their’s was doing. One gal came out when I was picking some weeds and pitching them in the compost pile. She told me what a bad idea that was because I would have weeds growing in the garden from the weed seed I was adding. I asked her if her garden was weed free and she said that she had plenty of weeds which was the hardest part of the gardening process. Somehow she didn’t put it together that she was providing advice on solving a problem that she hadn’t really solved. I explained to her that I pulled the weeds before they seeded and that even if they did have seeds, the heat generated in the pile would cook them. I don’t really think it sunk in. The pole beans I planted as an experiment and to try out the trellis have mostly germinated and are starting the climb up the poles. I’ll be very surprised if we get any beans – typically veggies won’t set properly in the heat. The cuc’s too have germinated and are looking surprisingly healthy. Same comment regarding eventually getting a crop. Great rain yesterday, almost 3”. We’re within 18” of having a swimmable lake so if July proves as wet as June, we should be swimming by August. Starting to see lots of smallish bluegill around the dock so we need to replenish our stock of fish food and start fattening them up.